The Progressive Gazette: Trix of the Trade - Satire! In increasingly unsurprising news, the AP has discovered that the brand known as "Trix" cereal is imbued with paint thinner. Commentators have responded, "Well, with a name like that, what did you expect?" Taking the subject a bit further, anxious mothers who have been feeding their children this garbage, we mean, food, have taken to the streets, protesting and rioting. Kathleen Halberd said for the group, "Just what sort of "tricks" are you employing here, sir?" All of this took place in front of General Mills headquarters; the rioting, the looting, everything! It was sensational news, which we love, because we are impartial observers. 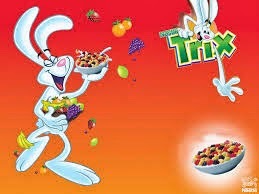 A spokesman for "Trix" responded. "Ha! Good one. By the way, the cereal is radioactive. And it's not cereal." Deranged mother number two, Michelle Wiseman, stood up and took the microphone. "All puns aside, we kind of feel like you guys are killing our children. Can you reassure us, please? The spokesman replied, "With all due respect ma'am, you are the ones killing your children. We just supply the bullets. Have you looked at what you are feeding them? At the advertising images? At the way we manipulate you? But here I am, giving away the tricks of the trade." After he had said that, the mothers became even more unmanageable, and began to storm the podium. But just then, a giant screen flashed on in front of them, and they were immediately pacified.